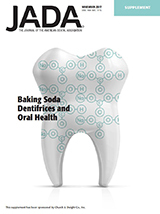 This six article annual JADA supplement explores the benefits of baking soda and oral health. This supplement has been sponsored by Church & Dwight Co., Inc. All content has been peer reviewed by the designated editors of The Journal of the American Dental Association (JADA). The opinions or views expressed in this supplement are those of the authors, and do not necessarily reflect the opinions or views of The Journal, Church & Dwight Co., Inc., or those of the American Dental Association.